Dr. Aukerman is a sports medicine physician who serves as the director of sports medicine for Samaritan, and senior associate athletic director/sports medicine at Oregon State University. 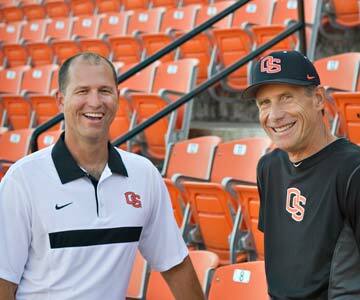 He manages the sports medicine program for all of the OSU intercollegiate athletic sports teams and clinical operations for Samaritan Athletic Medicine in Corvallis. Dr. Aukerman came to Corvallis after serving as a team physician at Penn State Hershey Medical Center in the Department of Orthopaedics and Sports Medicine. While with the Nittany Lions he worked closely with both the men’s basketball and football programs in addition to many of the other teams. He held the positions of primary care sports medicine physician, team physician and associate professor as part of Penn State’s sports medicine unit, which services all 29 sports teams as well as area high schools and the general public. He developed and was the fellowship director of the Penn State Primary Care Sports Medicine Fellowship program, which provides advanced training for physicians. Dr. Aukerman also maintained a clinical sports medicine practice in State College with the Milton S. Hershey Medical Center. Dr. Aukerman also served previously as the team physician for varsity athletics at East Tennessee State University in Johnson City. He currently serves as the medical review officer for NASCAR’s drug-testing program. An avid runner, Dr. Aukerman has completed several marathons, half marathons and numerous road races, including the Boston Marathon.